As described in the previous post (which looked at the 1996 record of Wilson’s Phalarope Phalaropus tricolor), there are at least 50 revisions to consider making to the 2014 Birds Korea Checklist. All such changes need to be considered carefully if the quality of the list is to be maintained and improved. Many of the changes are straightforward; a few require a lot more discussion and expert input (please! 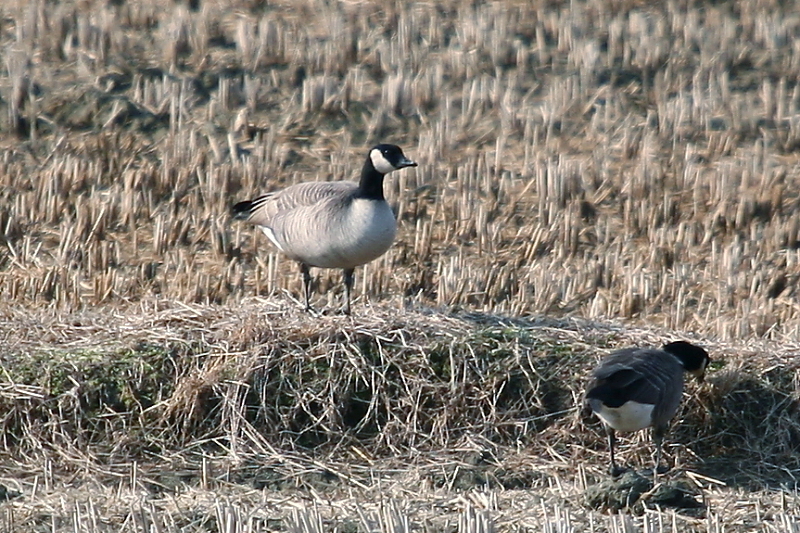 ), including the status in Korea of the confusingly-named taxa of “White-cheeked Goose” (Cackling Goose Branta hutchinsii and Canada Goose Branta canadensis). 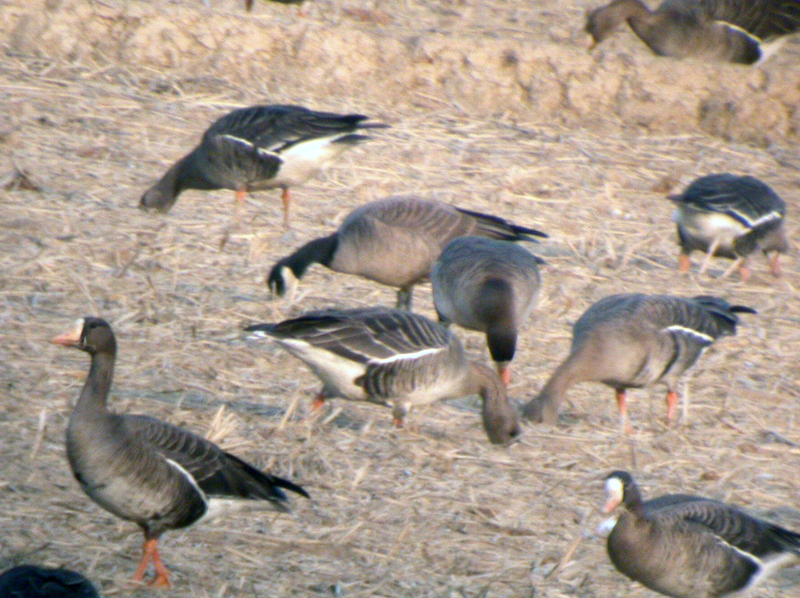 The status of the various taxa needs to be reassessed at this time most especially because the nation’s best field-guide (Park 2014) includes one record of taverneri and a possible record of nominate hutchinsii Cackling Goose, in addition to records of minima and leucopareia Cackling Geese. Should our Checklist also list these additional taxa? Taverneri is the largest subspecies of Cackling Goose. It overlaps in size and in several features with parvipes, the smallest subspecies of Canada Goose. Perhaps the most important ID feature for separating them is the long narrow bill of parvipes (Mlodinow et al. 2008). Of potential relevance to any discussion of taverneri in Korea, both it and parvipes are mapped as wintering southward and of breeding as far north as the North Slope of Alaska (Mlodinow et al. 2008), the origin of several species that are regular here (ranging in size from Dunlin to Yellow-billed Loon). This suggests that vagrancy of either or both of these long-range migratory taxa seems plausible. Also, Brazil (2009) includes both taverneri and parvipes as possibly recorded in Japan (although he uses different English names for the two species). He also mentions feral breeding of a large un-named subspecies of Canada Goose in Beijing and Japan too. Does anybody know which subspecies this might refer to? Unfortunately, OSJ (2012) does not include taverneri, parvipes or any other white-cheeked goose taxa as recorded in Japan beyond minima and leucopareia. And neither Brazil (1991) nor Eguchi and Amano (2004), who list invasive species in Japan, include Canada Goose. 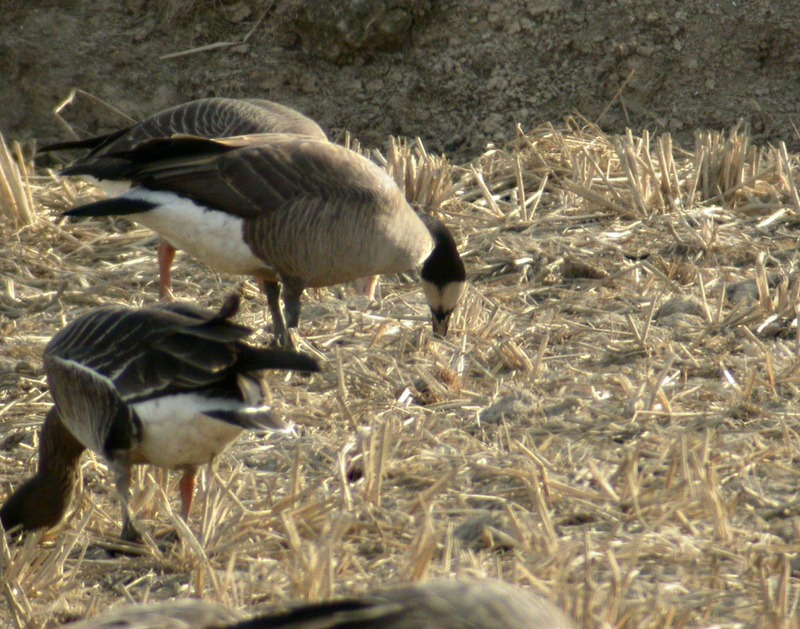 We presently include two taxa of Cackling Goose in Category One: minima and leucopareia. Both are assessed as WV1 (= scarcely recorded winter visitors, with more than 10 records each in total, but fewer than 10 records each year). The listing of minima and leucopareia seems uncontroversial, even though OSK (2009) chose not to list minima. To support our assessment our gallery contains recognisable images of both taxa, and Park (2014) includes much better images of both, showing e.g. the tiny bill, extremely dark breast and strongly patterned wing-coverts (with a paler grey base, dark sub-terminal line and pale fringe) of minima; and the larger size, larger bill, extensive white fore-collar and plainer-looking wing coverts expected of leucopareia. 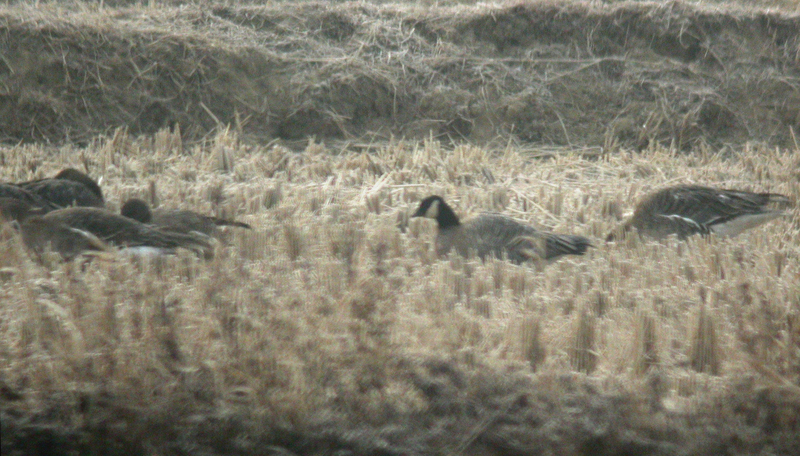 Minima Cackling Goose Branta hutchinsii with mixed flock of Tundra Bean Goose Anser serrirostris and Greater White-fronted Goose Anser albifrons, January 2009, Paju © Nial Moores. Even in an image as poor as this, minima can be confidently identified on the basis of its tiny size, blocky head, stubby bill, lack of white fore-collar, dark breast and strongly contrasting pattern on the wing coverts. 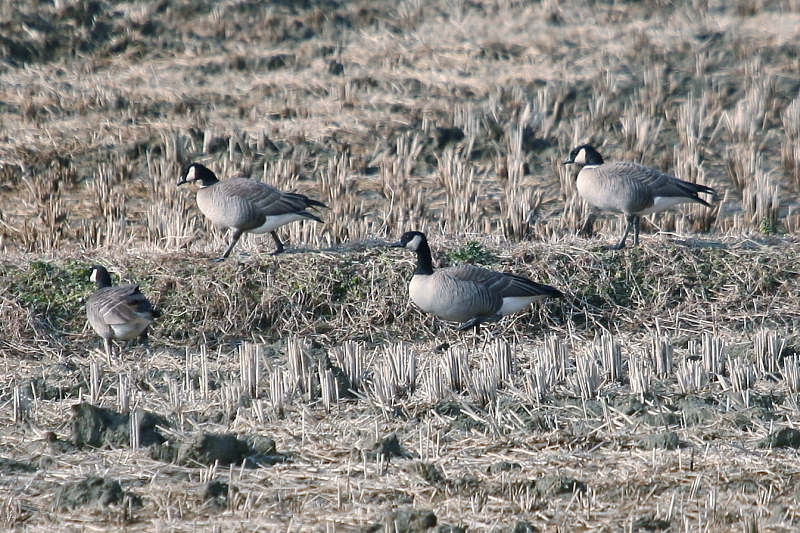 We also list Canada Goose in Category Six, the “pending” category, to capture the record of a larger-looking white-cheeked goose photographed by Dr. Kim Shin-Hwan and others at Seosan in December 2007. Based on the half-dozen or so images we saw of it, we suspected that it might be a parvipes Canada Goose (please see the entry in the 2007 Year Review). However, this bird was mentioned in footnotes in OSK (2009) as a suspected taverneri Cackling. It was also included as a taverneri by Park (2014), (perhaps after seeing additional images? ), requiring the writing of this post. Based on size alone, this bird indeed “should be” either a taverneri or a parvipes, and taverneri, being smaller than parvipes, might well be the safer bet. But without field experience of either and without detailed input from experienced observers, a bet really is not enough! The bill looks to me to have a flat lower mandible, a slightly convex culmen and a quite fine tip. At least, the bill shape appears noticeably unlike minima and leucopareia (or the 2007 bird at Junam: see below). Mlodinow et al. (2008) describe the bill of taverneri as “Usually rather stout and somewhat triangular, often with a bulge near base of lower mandible, almost imparting a Snow-Goose-like appearance”. They describe the bill of parvipes as “Long and slender, sometimes with convex culmen”. How would you describe this bird’s bill? A challenge in interepreting the bill shape comes from the separating out what is bill and what is background! Opening the same image (© Kim Shin-Hwan) in photoshop, removing colour, increasing contrast and brightness and blurring around what appears to be the bird at least helps to confirm that the lower mandible has a very flat and straight base, lacking any Snow-Goose-like-bulge. The length of the bill remains very hard to determine: is that grass behind the bird or glint on the tip? The bill seems to look long. Although the head appears to be very slightly turned, the bill from its tip to the rear of the lower mandible at the gape-line perhaps has a length approximately 65% – 70% that of the width of the head, measured from above the upper mandible to the nape. A work-in-progress online description of parvipes (Krueger, undated) states that the “Length of bill along bottom of lower mandible is equal to approximately 70-75% of the width of the side of the head” (it was unclear to me where he measured head width). Fully aware both of the lack of rigour in measuring birds from images (when even small differences in angle or distance can greatly affect perceptions) and the overlap in measurements of these taxa (Sibley 2004, 2007; Mlodinow et al. 2008), the total length of the larger bird with its neck retracted appears to me to be very approximately 15-20% greater than either of the two leucopareia in the first image. It also appears to be very approximately 15-20% bigger-bodied (both deeper from the widest part of the body from the side, and in the next images, rather wider across the “back” from behind too). The larger bird, although not massive, therefore seems likely to have had a substantially greater body mass than any of the three leucopareia it was with. Figure 3 in Sibley (2004, 2007) suggests that the mean difference in body mass of leucopareia and taverneri should be about 40%; and the mean difference between leucopareia and parvipes about 60-70%. Unidentified white-cheeked goose with three leucopareia © Kim Shin-Hwan. At least in this image, there is one obviously larger, bulkier-looking bird with longer wings that are held somewhat flatter. Did anyone manage images of the bird in flight from the side, to help assess true proportions of the neck and body? In addition to the bill, it is the different neck length between one of the leucopareia and the larger bird when both apparently have their necks fully stretched that appears most remarkable to me. Based on the image below, the larger bird looks to have a much more slender neck which is perhaps 40-50% longer than that of the leucopareia. The image in Park (2014) of the two standing next to each other with their necks half-extended also seems to suggest a similar or even greater difference. Mlodinow et al. (2008) state that parvipes has a “longer more slender neck than any of the Cackling subspecies”. Mlodinow et al. (2008) describe the plumage of taverneri as quite variable, with birds “Typically medium-gray-breasted becoming darker on belly / flanks.” The majority of parvipes, they state, are “quite white-breasted with darker belly/flanks”. Although I would not describe the bird as “white-breasted” it is clearly much paler on the breast than either of the leucopareia (especially in the image in Park 2014), which is described by the same authors as “Gray- to bronzy-brown-chested”. None of these images suggest to me that the Seosan bird had a gular stripe, although this can be difficult to detect unless the bird can be seen from behind with its head down. Either way, Mlodinow et al. (2008) state that 40-75% of taverneri show a gular stripe, but less than 1% of parvipes do. Finally, Mlodinow et al. (2008) suggest that sometimes parvipes shows a “step-off narrowing of cheek patch at level of eye, a feature that is uncommon in other taxa” except nominate hutchinsii. I do not yet quite understand what a “step-off narrowing” in the cheek patch means (! ), but is there a slight indent in the cheek patch behind the eye in the larger bird, when compared with the leucopareia? Mlodinow et al. 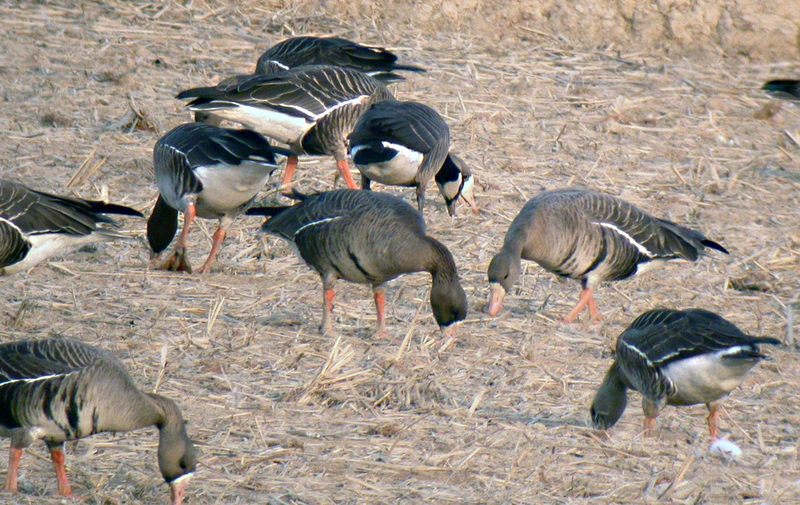 (2008) state repeatedly that many individuals of these white-cheeked geese cannot be identified to taxon; and they describe many exceptions to pretty well all the taxon-level criteria that they painstakingly set out. Can the Seosan bird actually be identified? If so, what is it? Parvipes or taverneri? If it is not identifiable, then what to do with this record? The Seosan bird is not the only white-cheeked goose that requires further review either. Park (2014) also includes an image of a possible nominate hutchinsii. As depicted in Park (2014) this bird, photographed at Junam Reservoir on February 25th 2007, has a short triangle of a bill recalling minima, allowing confident identification as a Cackling Goose. It lacks the white fore-neck collar shown by almost all leucopareia and it also lacks the purple-brown breast and strong contrasts in the wing-coverts shown by many minima. In the image in the book, it also appears to lack the paler breast of the Seosan bird and it looks quite large. 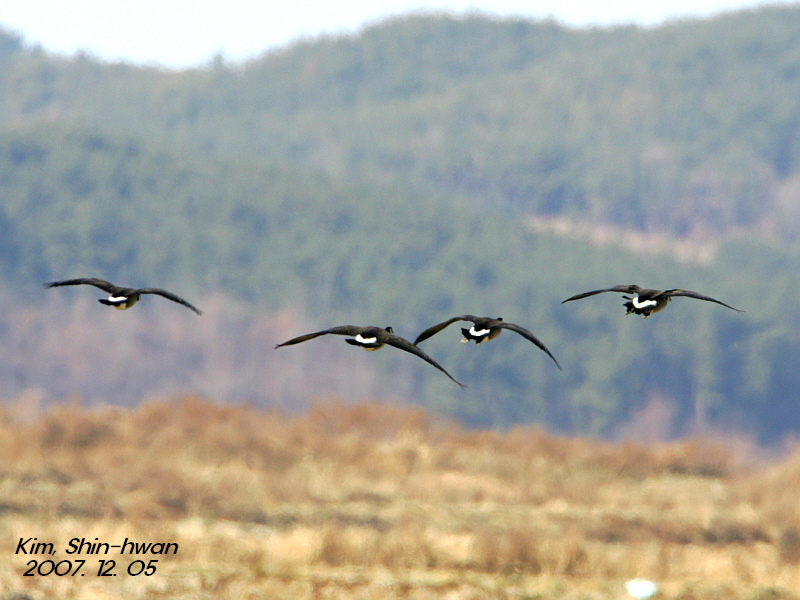 Fortunately, I saw what was presumably the same bird several times (at least Birds Korea only knew of one white-cheeked goose at Junam that winter: see 2007 Year Review). I also managed some very poor images of it, on both January 13th and February 27th . As it was a long-staying bird, I strongly suspect that better images by others can be found to help show details of the bill profile. I was instead most focused on trying to see if it had a gular stripe or not, as this was thought at the time to be an important feature for the identification of parvipes (presence = not likely to be a parvipes; absence = likely to be one) Although poor, my images show that it did have a broken gular stripe and that this Cackling Goose also looked very large, bigger than perhaps 10% of the local frontalis-type Greater White-fronted Geese Anser albifrons that it was with. How big is that? In his field-guide on Japan and East Asia, Brazil (2009) gives the size range of Greater White-fronted Goose as 65-86cm and Svensson et al. (2009) give the size of the two Greater White-fronted subspecies in the Western Palearctic as 64cm-78cm, with Greenland flavirostris larger than the nominate. It therefore seems reasonable to assume that birds toward the lower end of the range given in Brazil (2009) will be nominate albifrons (types) which occur uncommonly east to Korea (at least), and the largest birds will refer to “big-end” male frontalis-types. As there were no albifrons-types present in that flock, most of the Greater White-fronted Geese will have been >70cm in length. The Junam bird was therefore also at least 70cm in length. 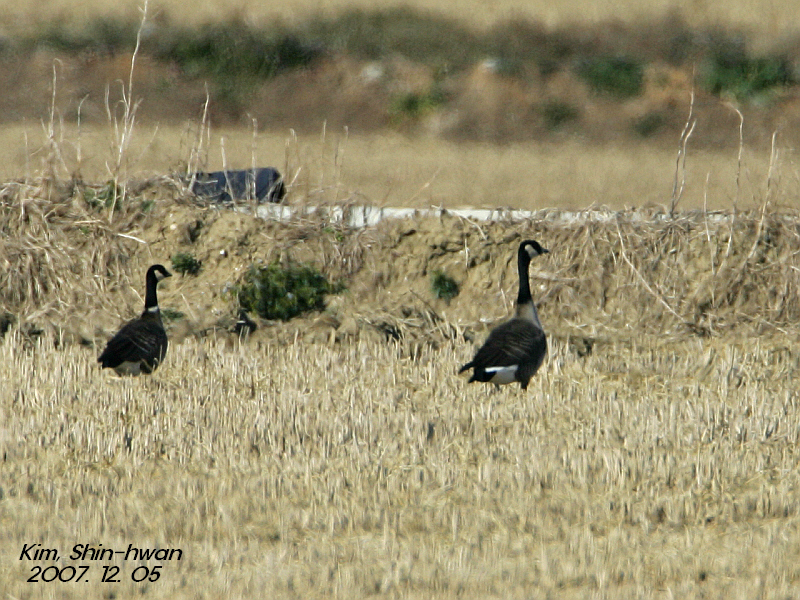 As such, this Cackling Goose would likely have overlapped in size with some parvipes. According to Mlodinow et al. (2008), hutchinsii (which is the ID that was mooted for this bird) is quite variable in size. However, it is smaller westward and in the west (the more likely origin of any vagrant to this region) it can even be similar in size to minima, the smallest of the Cackling Geese taxa. Size alone is clearly a major problem with the identification of this bird as a hutchinsii. Its size instead points strongly toward it being a taverneri! Presence of a gular stripe, though this was incomplete. Between 40% and 75% of taverneri show a gular stripe. Within the next few days and weeks I will try to contact with white-cheeked geese specialists in North America in the hope of their expert input, which we can then follow. I would very much appreciate if anyone reading this far would also do the same, and / or also offer their advice in the comments box below this post. Brazil, M. 2009. Birds of East Asia. Helm Field Guides. Eguchi K. & Amano H. 2004. Invasive Birds in Japan. Global Environmental Research 8(1)/ 2004: 29-39. Printed in Japan (in English). Mlodinow, S., Springer, P., Deuel, B., Semo, L., Leukering, T., Schonewald, T., Tweit, W. & J. Barry. 2008. Distribution and Identification of Cackling Goose (Branta hutchinsii) Subspecies. North American Birds. Volume 62, Number 3: 344-360. Svensson, L., Mullarney, K., Zetterstrom, Z. & P. Grant. 2009. Collins Bird Guide. Second Edition. Thank you for this information from Beijing: much appreciated. As part of this challenging identification process, I also mailed last week to several North American ID specialists to seek opinions on the two white-cheeked geese shown in this post. These experts include Mr. Steve Mlodinow (SM) and Mr. Bill Tweit (BT): both authors of the authoritative paper on white-cheeked geese cited throughout this post, as well as of the “Birds of Washington: Status and Distribution”. 3. Both SM and BT consider that the Seosan bird is instead “much more likely a parvipes” Canada Goose (B. T in lit. July 20th 2015). According to SM, “The head shape, bill shape, indented cheek patch all bespeak parvipes… No taverneri would be that much larger than leucopareia. .. The nice contrasting white chest fits parvipes nicely” (SM in lit. July 14th and 16th, 2015) BT stated that, “The bird with three leucopareia is considerably more difficult…there is growing evidence that taverneri and parvipes intergrade at several locations in Alaska, so identification from a photo is problematic. I place a great deal of importance on voice, so any field notes on voice would be quite informative. Parvipes tends to ‘honk’ while taverneri tends to ‘gabble’, with an occasional ‘whoop’ thrown in. We believe the ‘whoop’ note is diagnostic for taverneri. All that said, from the photos, the bird looks like a light breasted parvipes, or other ‘Lesser’ Canada. Much too long-necked and long-billed for taverneri in the photos, and really does not even show any indications of intergradation.” (BT in lit. July 16th 2015). 4. Both consider the Junam bird to be even more difficult to identify with any level of confidence, in part because of the poor quality of the images; because the few images that there are seem to suggest contradictory impressions; and because there do not seem to be sound recordings of the bird. BT wrote that the images “show a bird that is clearly not a small Cackling” and that he was “pretty sure” that it was “not a hutchinsii, minima or leucopareia” (BT in lit. July 16th 2015). SM wrote, that he cannot “say anything definitively without a good look at bill and head shape” but that the images suggest that it has “a taverneri feel based on color, gular stripe, apparent neck length (shorter than parvipes would have)…Your description sounds much like a taverneri. 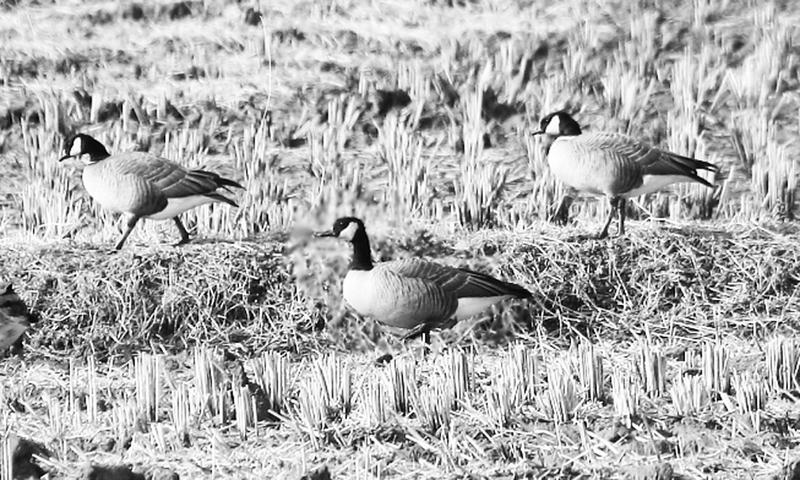 They look like big hefty Cackler, or small Canadas, but their bill tends to be shorter than that of any Canada, but also quite stout, even more so than can be seen in some other types of Cackler. The taverneri from w. Alaska are dark birds, and my reaction in Washington State was often that someone stuck a thick Cackler bill and short (compared with Canada) neck on a Canada body” (SM in lit. July 16th 2015). We welcome more comments from experienced observers and better images (and sound recordings) of these birds to share, in order to build confidence in the identification of these two individual geese and also to help assess future records of white-cheeked geese.